Clothing of Rajasthan is really excellent and lively. It shows the spirit of the inhabitants, their religion and culture. Women wear colorful and beautifully designed clothes that show charming and graceful. Royal Ranisa provides the multicolor Rajputi Women Dress in Jaipur you can buy the best and handwork Rajputi Poshak to the customer at an affordable price. Rajputi Women Dress or the poshak of Rajput is based on the tradition and culture of Rajasthan. The dress consists of the Ghaghar, Kurti/kanchli Odhani When women wear Rajputi Poshak then she looks adorable. Rajputi Poshak gives a royal and ethnic look to the woman wearing it. 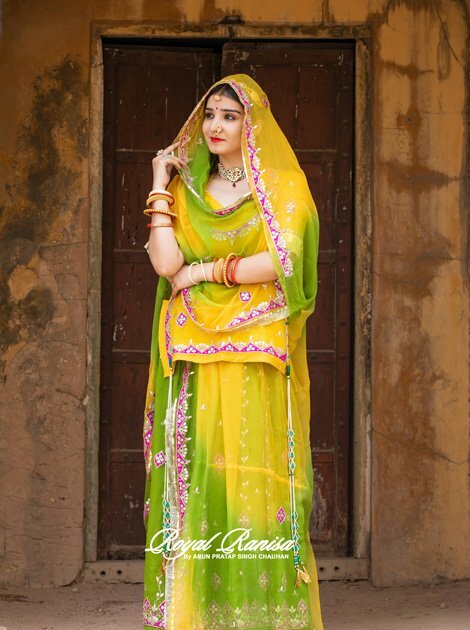 Though the Rajasthani women use the special kind of poshak for the wedding there are many casual wear dresses such as ladies suits, ghaghra, lehenga kurti used by Rajputi women. Therefore Rajputi Poshak is designed by experienced designers from Jaipur who has the perfect knowledge about various handwork and fabrics. If are you a person who likes to wear light color and vibrant dresses then the Rajputi Poshak will definitely attract you. Women Rajputi Dresses are ethnic wear of rajputi clan of Rajasthan. At Royal Ranisa you can choose the best and quality of Rajputi Poshak at an affordable rate. We offer the Latest women Rajputi Dress in Jaipur with multicolors. You can find the Rajputi poshak with Great ornate work and of perfect quality from RoyalRanisa. You will be able to enhance your beauty with these wonderful ethnic wear. The Rajputi women folk are known for the pretty designed dresses that they wear. 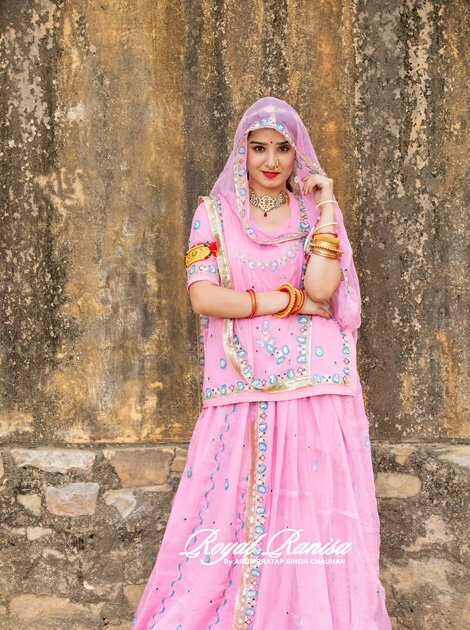 One of the most popular Rajasthani dresses that bring out the culture and heritage of Rajasthan in its true sense is the Designer Women Rajputi Poshak. In addition to above, we have a huge collection of the Rajputi Poshak. Multicolor Rajputi Dress is available atRoyal Ranisa store in Jaipur. Moreover, this is a special kind of a garment that makes the Rajasthani women look beautiful and graceful. Every girl grows up thinking about her wedding day and pays attention to the finest details, therefore Royal Ranisa is the best to shop to buy women Rajputi Dress in Jaipur like Red Zari & Zardozi Bridal Rajputi Poshak to you on Wedding Functions. However, The royal rajputi poshak is elegant and easy to manage even in wedding and cultural functions. The poshak comes with unstitched and stitched Kurti/kanchali, odhana, Lehenga and one satin lining. This Bridal poshak shows the true royalty of Indian heritage. Colorful Rajputi Dress has attracted the attention of the young and old women in India and abroad. We have an amazing collection of colorfulRoyal Dresses in Jaipur. You can find Attractive Rajputi Poshak which depicts the rich and colorful cultures as well as the craftwork of the state. Similarly, women Rajputi Dresses are created with lots of attention to the work. Royal Ranisa provides the multicolor Women Rajputi Dress in Jaipur you can buy the best and handwork Rajputi Poshak to the customer at an affordable price. Rajputi Poshak is created according to their customs tradition, the latest Casual Rajputi Poshak comes with latest designs and patterns to suit the needs of modern women. As a result, Rajputi Poshaks are in great demand all over the world due to the natural and vibrant look it provides and due to the comfort offered by these garments. Your Ethnic wear collection is incomplete without a pair of colorful Rajputi dress. Therefore if are you searching for the best store in Jaipur for women Rajputi dress then You can Buy Rajputi poshaks from trustworthy stores like Royal Ranisa. Royal Ranisa provides the multicolor women Rajputi Dress in Jaipur you can buy the best and handwork Rajputi Poshak to the customer at an affordable price.